Staton Flurry's Mr. Misunderstood remained perfect in seven starts on turf when he made a sweeping move at the top of the stretch to easily cruise by the leaders and beat Parlor by 1 ½ lengths in Saturday's 14th running of the $100,000 Commonwealth Turf (Grade III) at Churchill Downs. Sent to post as the odds-on 3-5 favorite in the field of eight 3-year-olds, Mr. Misunderstood – named after the Eric Church hit song – covered 1 1/16 miles over firm turf in 1:46.80. Florent Geroux, who won last weekend's Breeders' Cup Classic aboard likely Horse of the Year Gun Runner, rode the winner for Louisville-native trainer Brad Cox. The Commonwealth Turf was Mr. Misunderstood's first graded stakes triumph but fourth straight win against stakes company. Previously, he won the $60,000 Prelude and $200,000 Super Derby at Louisiana Downs before winning the $100,000 Jefferson Cup (Listed) at Churchill Downs in September. Mr. Misunderstood joined Inca King (2007) and Heart to Heart (2014) as the only 3-year-olds to sweep Churchill Downs' Jefferson Cup and Commonwealth Turf in the same year. Mr Cub set a dawdling early pace of :25.65, :50.89 and 1:16.35 as Mr. Misunderstood raced near the rear. In fact, he was last when the field exited the far turn. Geroux dropped his hands and asked Mr. Misunderstood for his best run. The tandem had clear sailing from the outside and engulfed the leaders within an eighth of a mile. Parlor made a belated late run to get second and was 1 ¼ lengths ahead of Mr Cub who held third. It was another neck back to Gorgeous Kitten, who was followed in order by Giant Payday, My Bariley, Tiz a Slam and Sharm El Sheikh. The victory was worth $60,140 and increased Mr. Misunderstood's earnings to $364,694 with a record of 7-1-0 in 11 starts. Mr. Misunderstood returned $3.40, $2.60 and $2.10. Parlor paid $3.40 and $2.80. Mr Cub paid $3.80 to show. 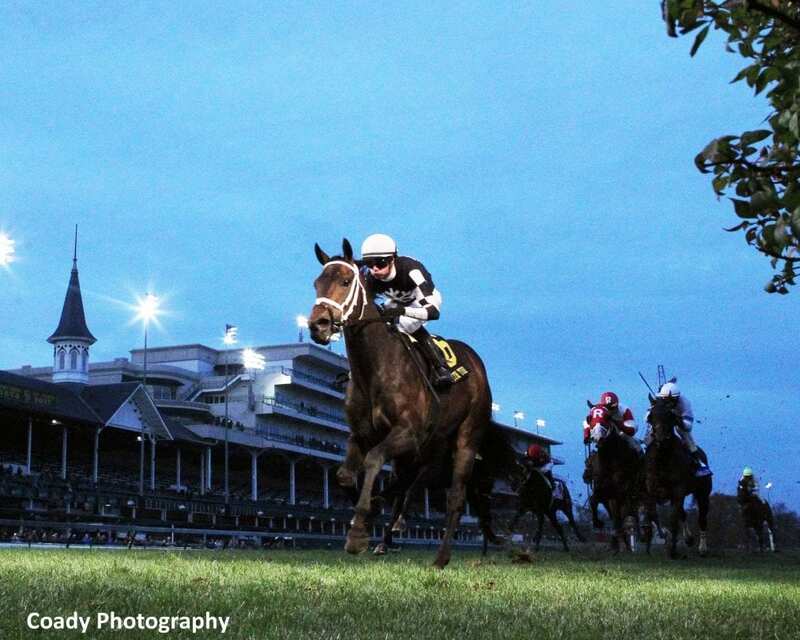 Racing at Churchill Downs resumes Sunday with a 10-race program that begins at 1 p.m. ET. This entry was posted in Racing and tagged archarcharch, brad cox, churchill, churchill downs, Commonwealth Turf, Florent Geroux, Jefferson Cup, Mr. Misunderstood by Press Release. Bookmark the permalink.